It’s “back to school” time! Some of my friends’ kids went back weeks ago, while others aren’t starting for another week… crazy how the start times can vary so widely. As I was browsing Pinterest for a few minutes hours, I kept coming across the cutest ideas for Back to School Treats… so I just had to gather them up & share them with you. 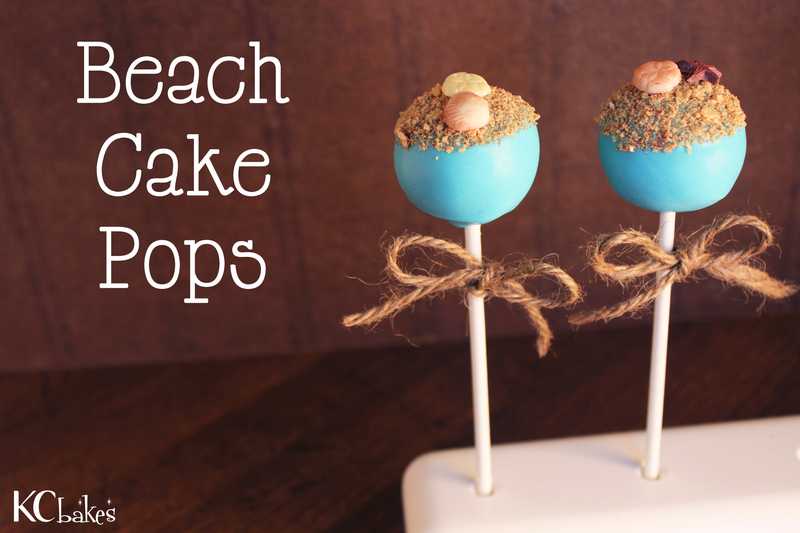 Regardless if your kiddos are in-session, or still enjoying the last days of vacay, these fun treat ideas will brighten anyone’s days – teacher or student! Ok, these next ones aren’t sweet… but COME. ON. I would eat every subject, lol. They are SO CUTE! 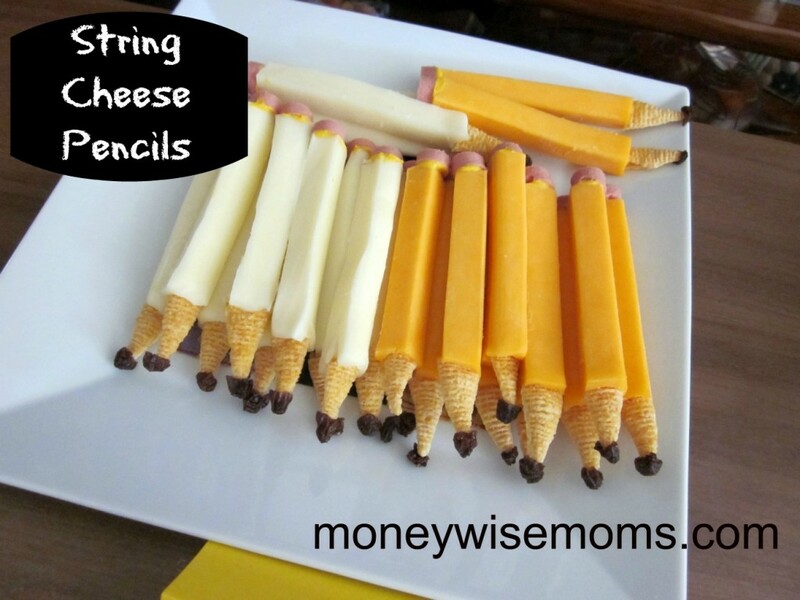 What will you make for back to school? I don’t know about you, but summer is flying by me at warp speed this year, its already mid-August! 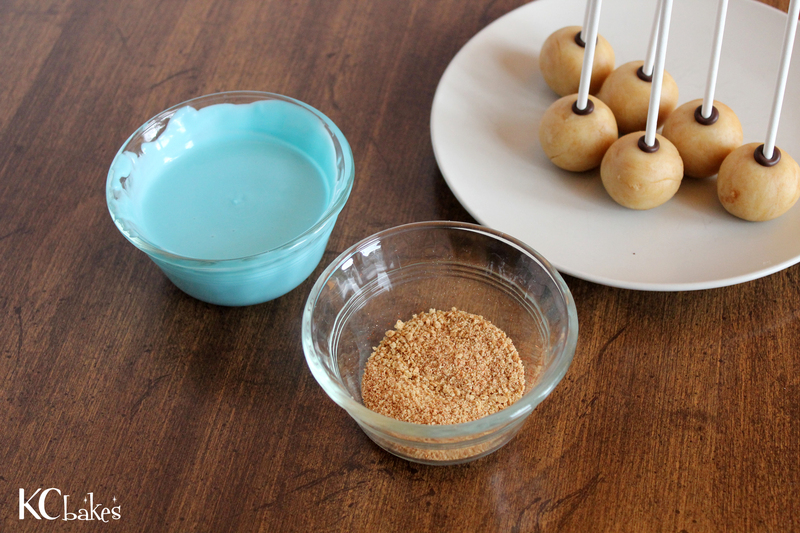 This past weekend, on Saturday, August 9th, I hosted my fifth event, the New York Cake Poppers Meet-Up, in Astoria, New York! 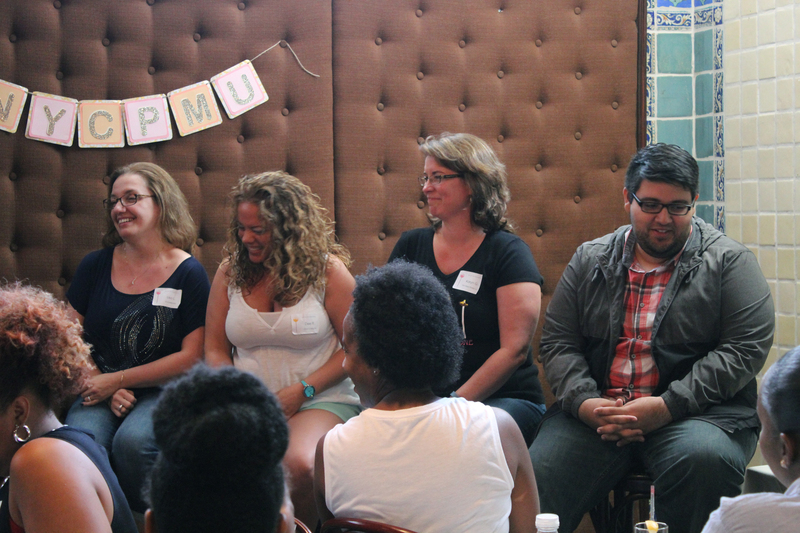 Search #NYCPMU on Instagram for pictures from the event. We all gathered at The Astor Room, which is an amazing venue. Not only is it newly-renovated & simply gorgeous, with an amazing staff and delicious food – but it’s full of history as well! It was originally built as a commissary to a film studio that became Paramount Pictures & and major shows like Orange is the New Black and Sesame Street are filmed right next door. 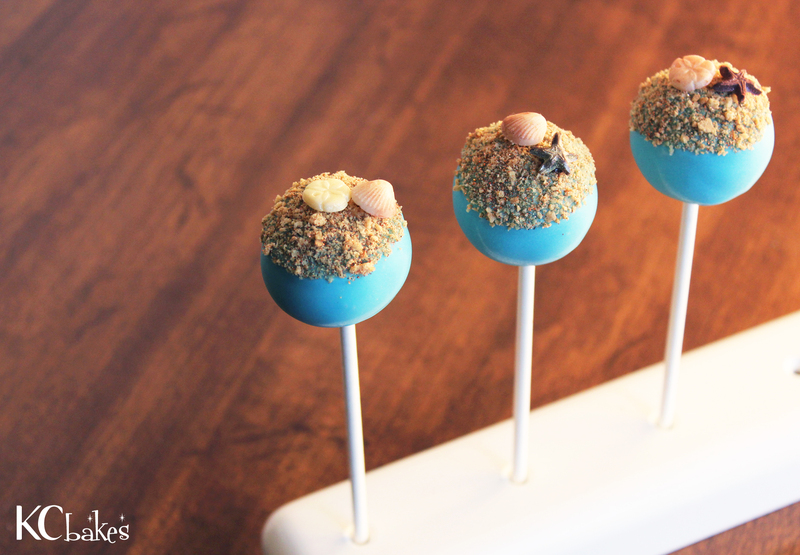 Lisa (The Sweet Tooth Bar) styled and created this gorgeous (& delicious!) 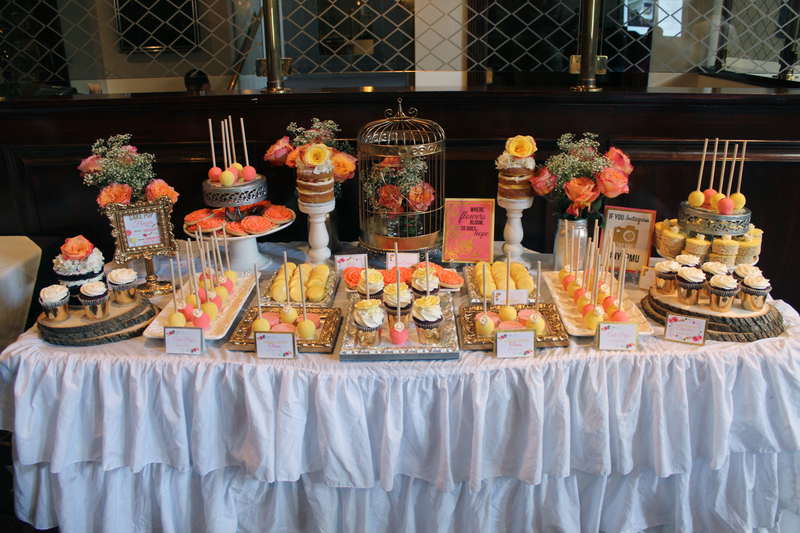 dessert table! Carolina (The Sugar Penguin) contributed her yummy sugar cookies, and Crystal (Lulu Popz) made the amazing mini cakes. 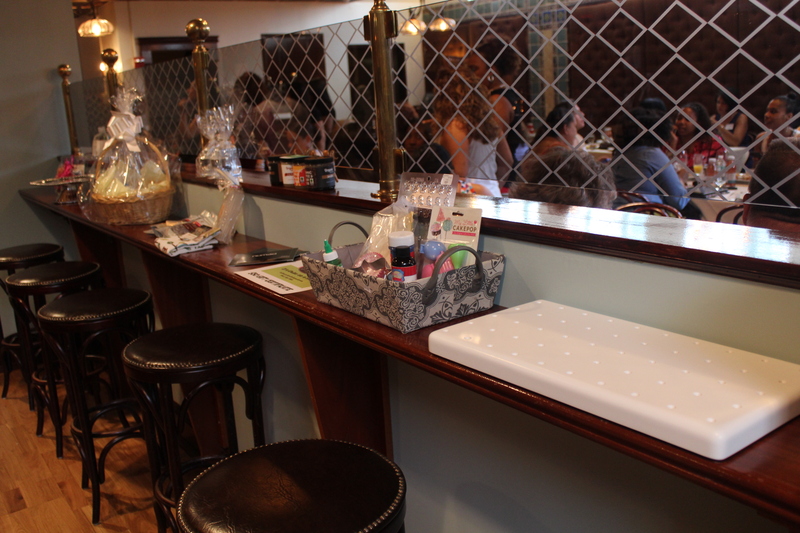 The swag bags were hung by their chairs with care, and super fun raffle prizes were on display, waiting to be claimed. 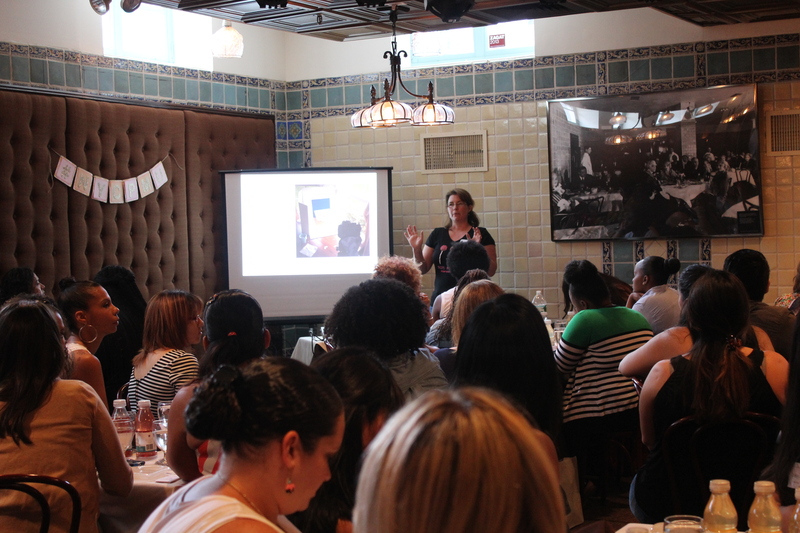 Karyn of Pint Sized Baker led a really good session on Food Photography. She discussed elements like photo editing and staging, and also showed us how just the slightest changes in lighting and composition can make all the difference in getting a great photo, regardless of whether you are using an phone or DSLR camera. She also brought her camera and hooked it up to her laptop to do a mock photoshoot right there in the restaurant, demonstrating how she takes pictures for her blogs Pint Sized Baker & Dieter’s Downfall. I did a little presentation on Social Media Do’s & Don’ts… thankfully no one snapped my picture – I’d rather be behind the camera than in front of it, haha. 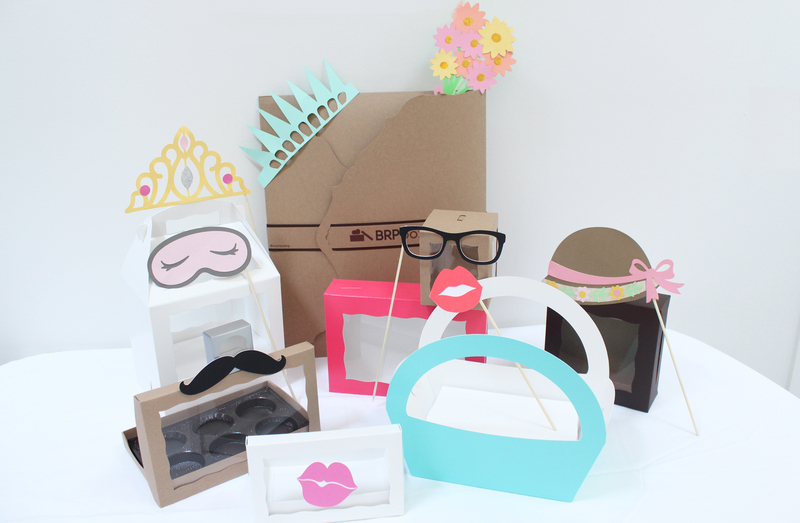 Most cake poppers connect through social media, that’s how these meet-ups got started after all – so this session provides the bakers with ways to build their brand to create a positive experience for their followers. We had a fantastic panel session too! (L-R): Lisa (Goodiebites), Dee (Diva’s Delights), Karyn (Pint Sized Baker) & Noel (The Cake Poppery). 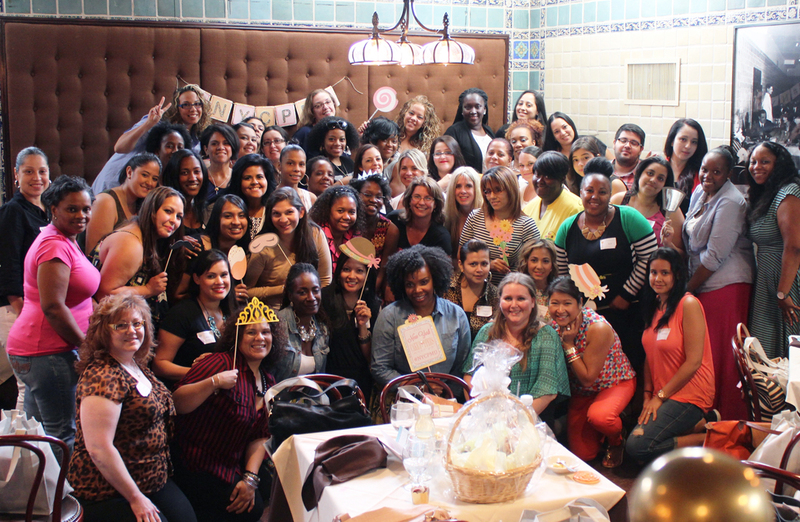 I can’t remember the specific comment that gave them all the giggles, but this portion of the event was so much fun… the bakers asked some great questions, and there were really informative discussions that followed – some of the topics included how to handle large orders, charging deposits and structuring order pick-up times. Noel also shared about his publishing experiences. 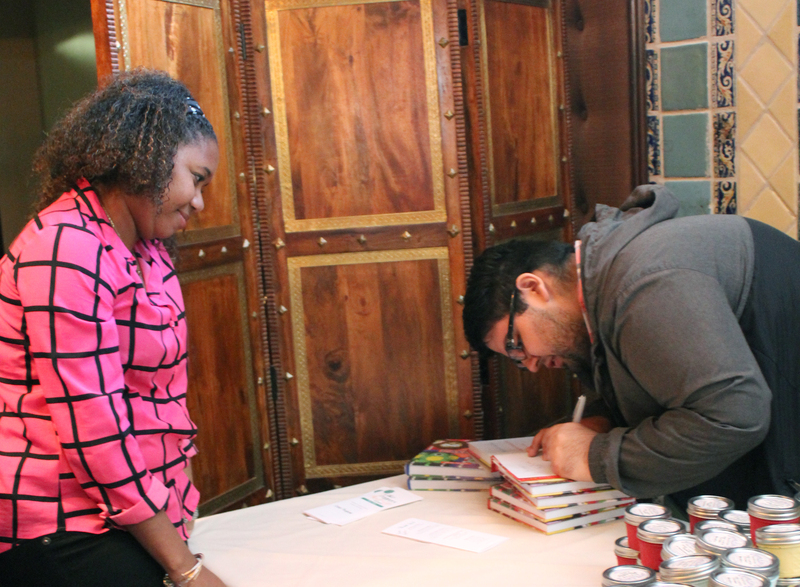 To wrap up the day, Noel did a book signing of his two books – The Art of Cake Pops & Amazing Cake Pops (find them here on Amazon). 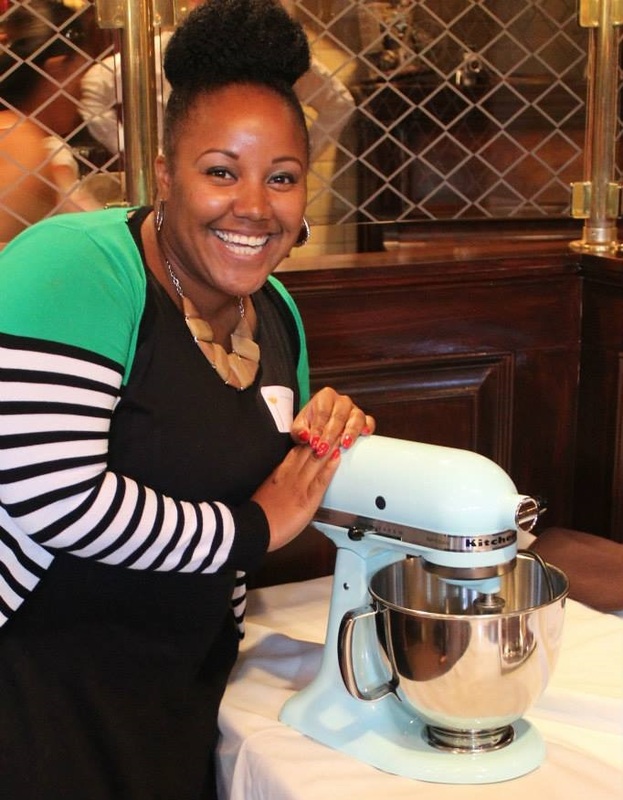 Then we had one extra special raffle prize… a KitchenAid Artisan 5-Quart Stand Mixer! 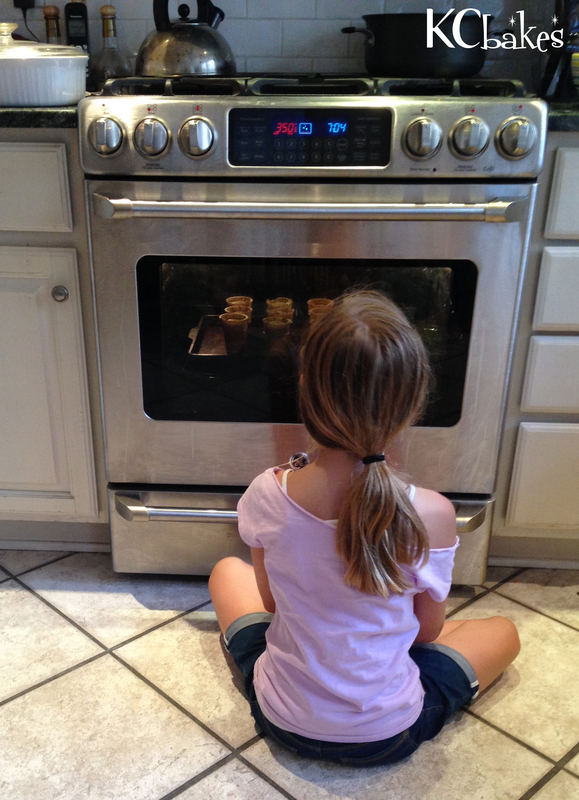 Bakers posted a pic of themselves on Instagram or Facebook to enter, which resulted in some really cute (& wishful) photos – baker Al D. was the lucky winner! 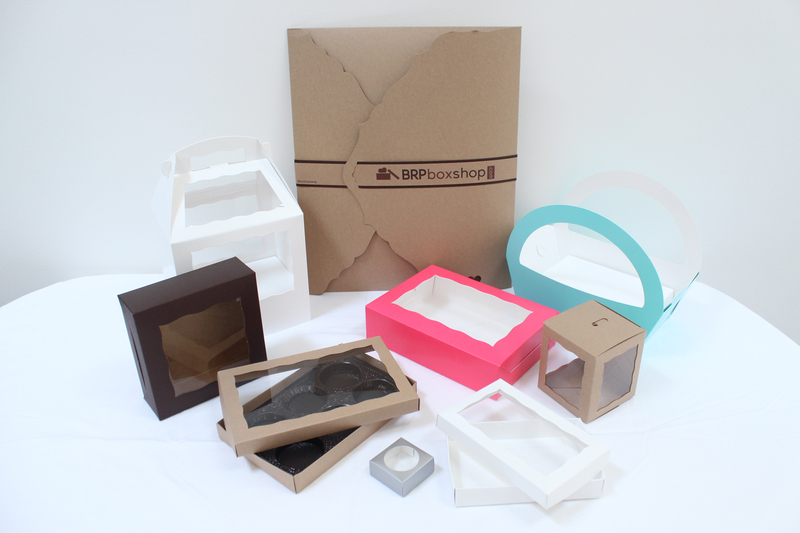 Speaking of prizes… the NYCPMU Swag Bag Giveaway!!! Those boxes have minds of their own, though… I turned my back for one second, and they got into the NYCPMU photobooth props made by Jenae Creates! 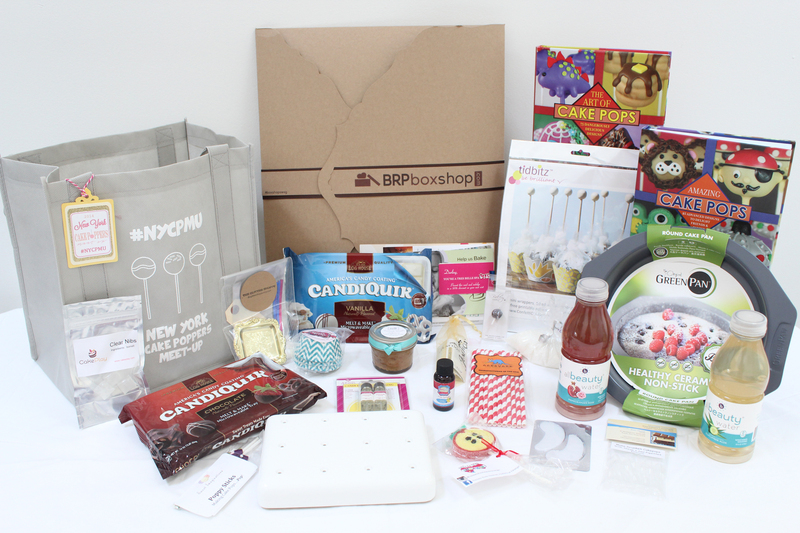 PLUS – both of Noel’s books and a KC Bakes mini cake pop stand!!! What has been your favorite memory so far this summer? Was it a vacation? A party? A special moment with family? Share in a comment to be entered to win! After you leave a comment, please navigate to our Rafflecopter to verify that you commented (link below). Be sure that you are signed into Facebook and it should only take you 2 minutes to earn 24 more chances to win all of these amazing prizes! 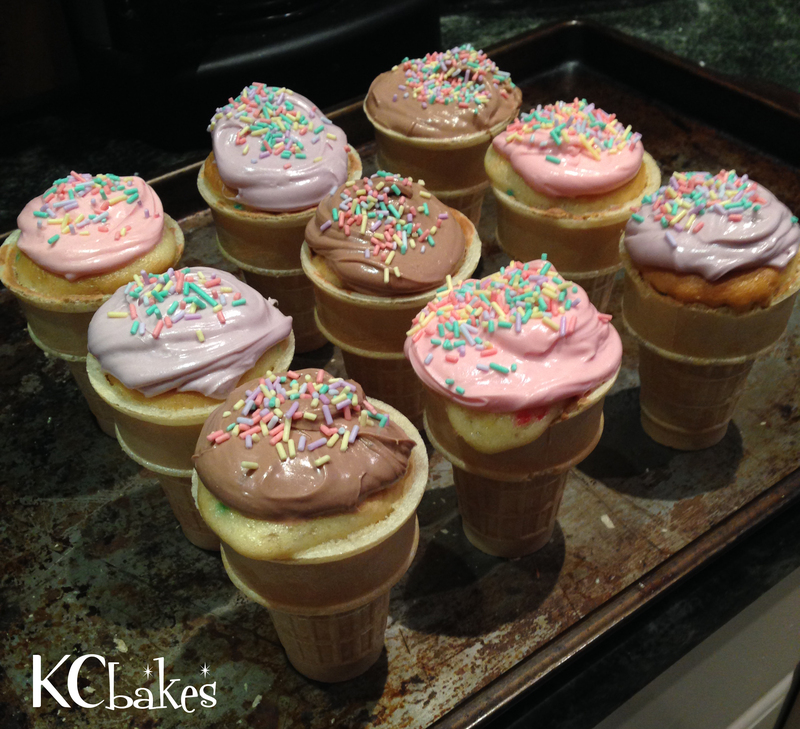 I scream, you scream, we all scream for… cupcakes? That’s right! 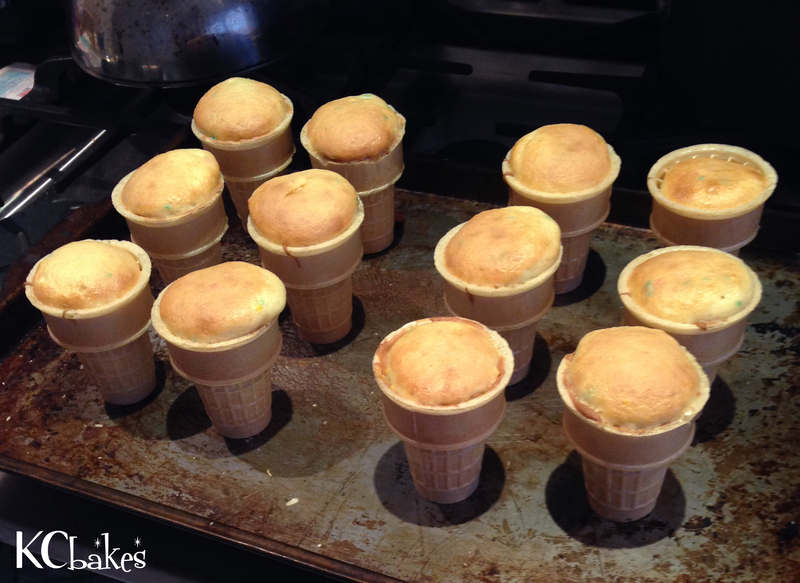 Ice cream cone cupcakes have been a favorite of mine, ever since my mom made them I was younger. 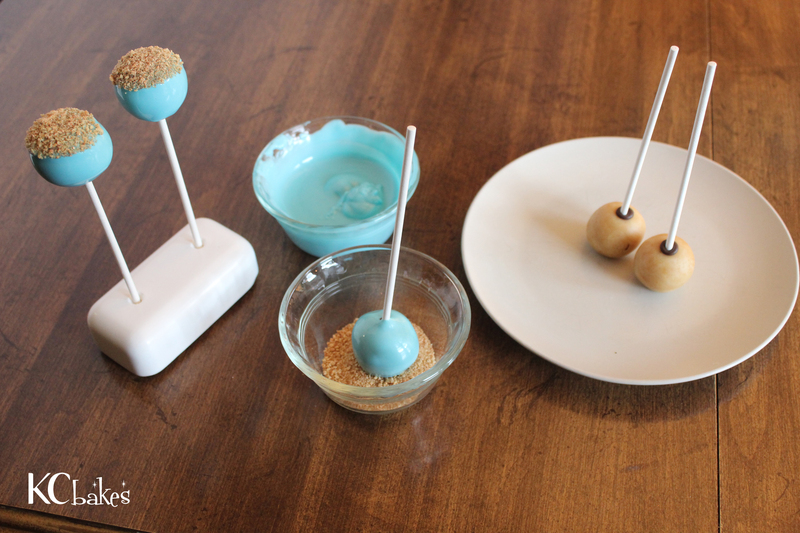 They are such a fun way to serve cupcakes, and I have a new twist to make them into an interactive activity for kids. 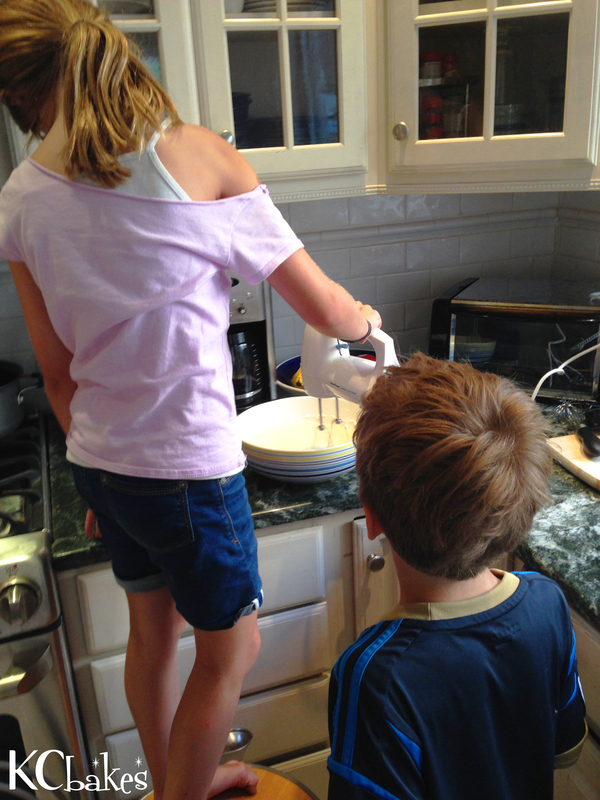 I was babysitting my niece and nephew, ages 6 and 9, who have grown used to the fact that every time I come over, we are baking something. 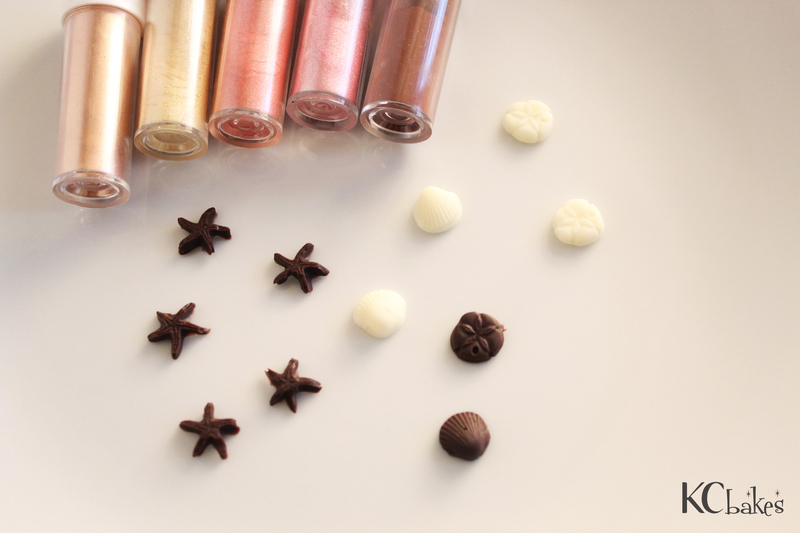 We’ve made quite a few things over the years, from Tie Dye Cupcakes, to cake pops, cookies and more… so I wanted to do something different. Pre-heat your oven to 350 degrees & prepare the cake mix as directed on the box. 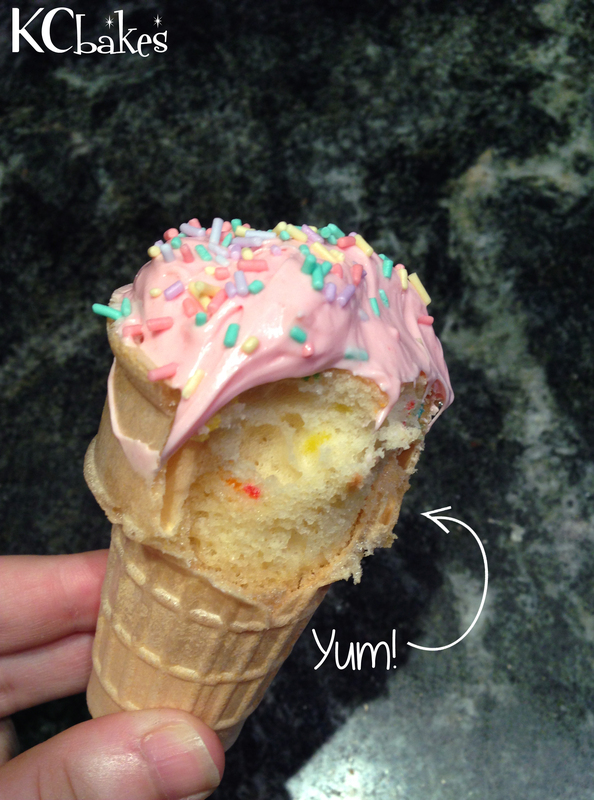 You can use any flavor mix, but I like using Confetti Cake because the cake looks more colorful when you bite into the cone. 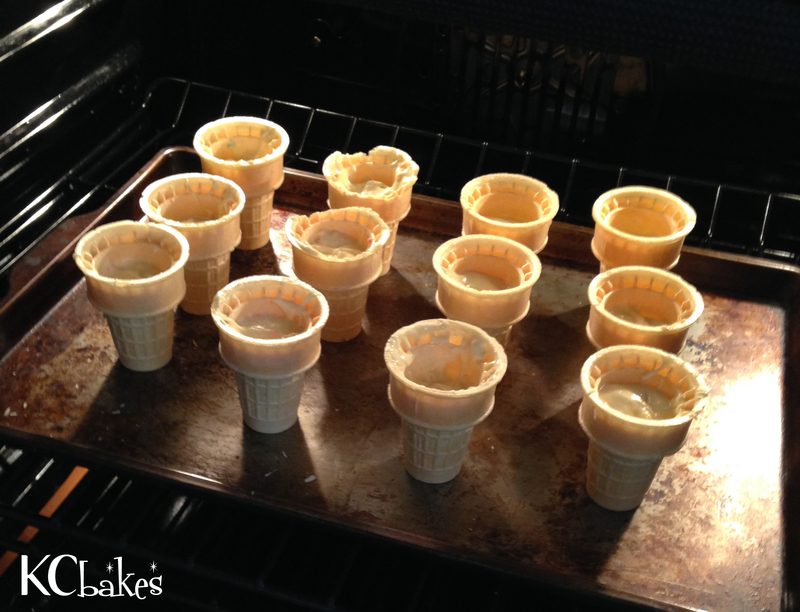 Portion 2 tablespoons of batter into each cone. It doesn’t sound like a lot, but trust me, it is just the right amount. 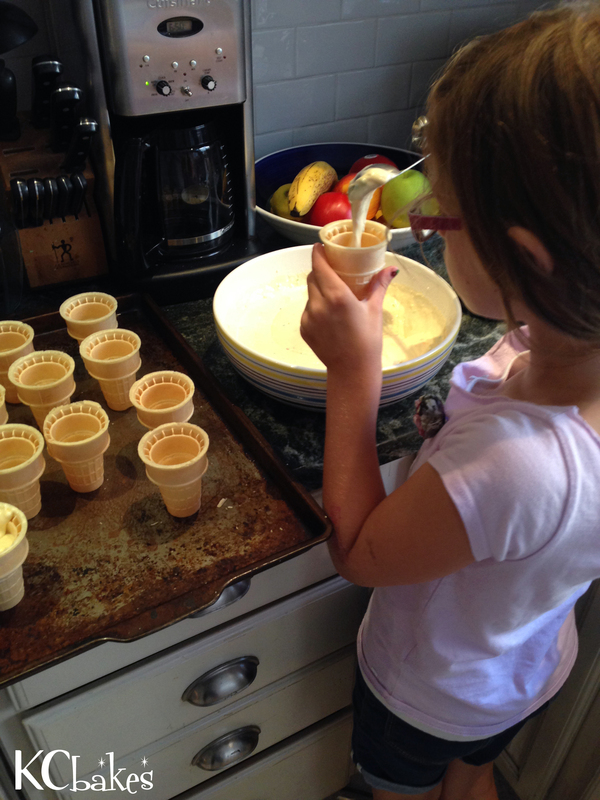 If you don’t have measuring spoons handy, any spoon will do… just let your kiddos know to fill the cones to just below the inner ridge of the cone (below the open squares/pockets that go around the top/inside of the cone). In the oven they go for about 20 minutes. Keep an eye on them around the 18 minute mark. 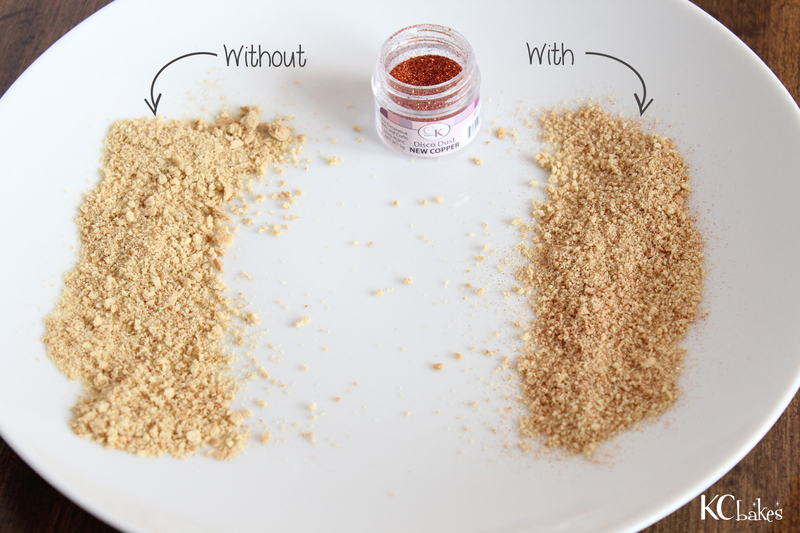 If the tops start to get golden brown, bring them out and test the cake with a thin knife or tooth pick… if the knife/pick comes out clean, then you’re all finished. 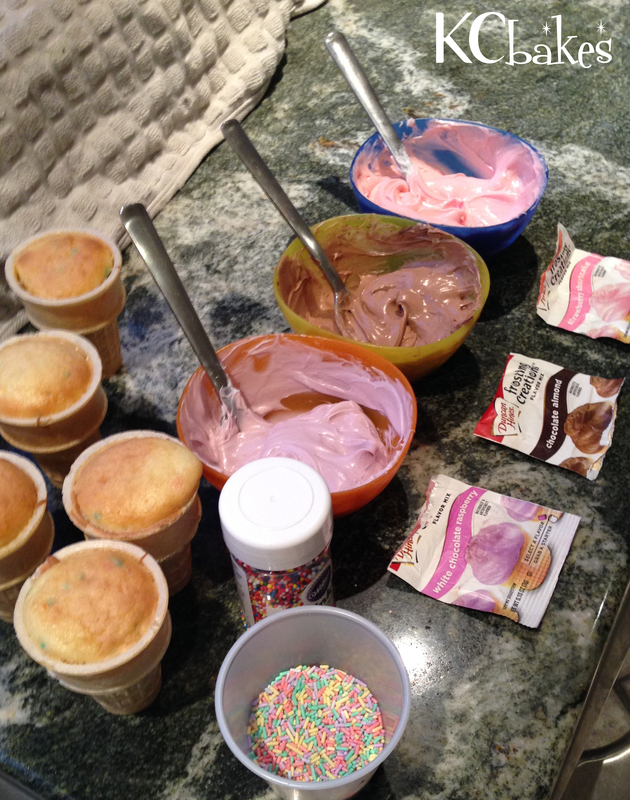 As the cones are cooling, begin to prepare your “ice cream” (aka various flavored frostings). 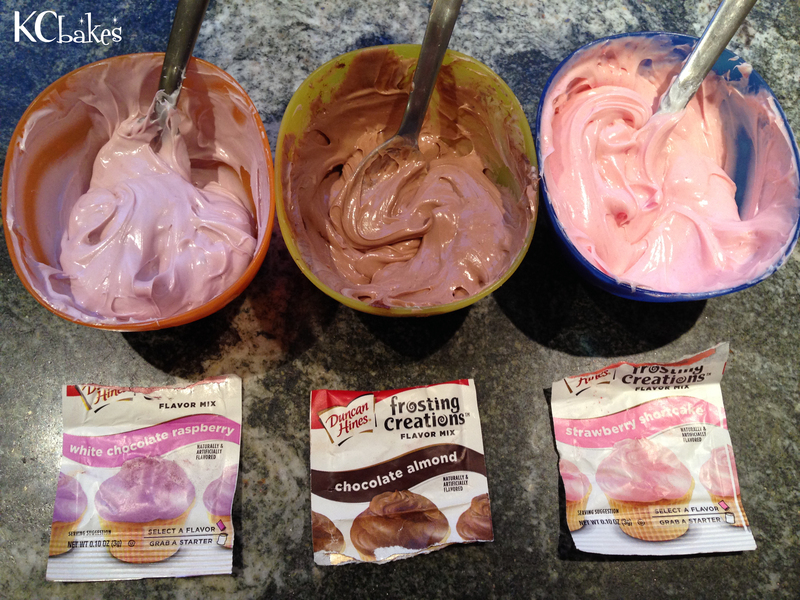 One can of Duncan Hines Frosting Starter is all you’ll need; simply portion it out in equal amounts into smaller bowls. Start by sprinkling in about a third of the flavor mix, stirring thoroughly. 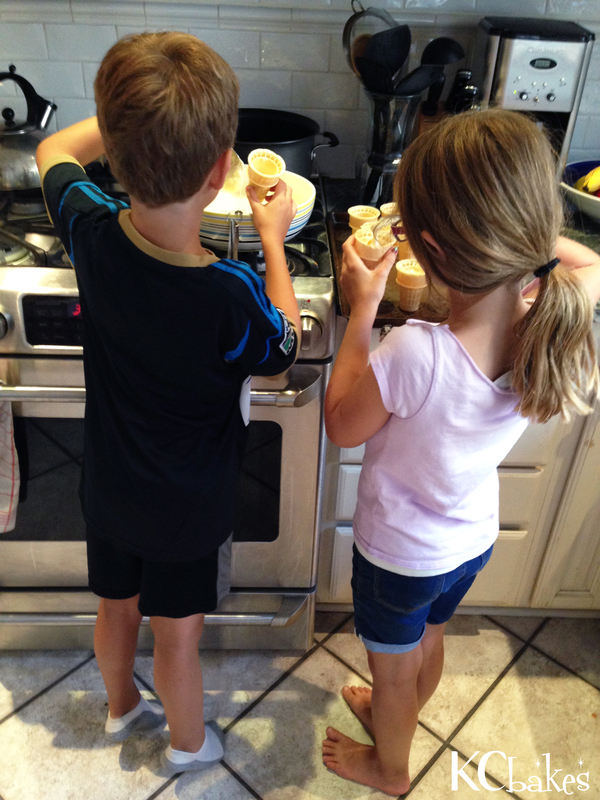 Using a separate spoon, taste a small amount to determine if you need more flavoring… this was the kids’ favorite part – somehow we kept needing to taste more & more! Time for dessert! 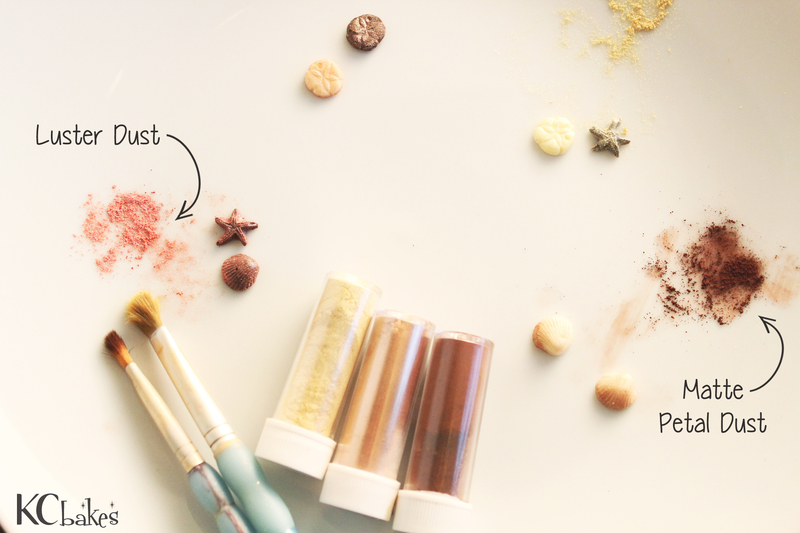 This would work great for a birthday party treat… everyone can add their own “ice cream” frosting and toppings for a DIY “Ice Cream” Cupcake Bar. 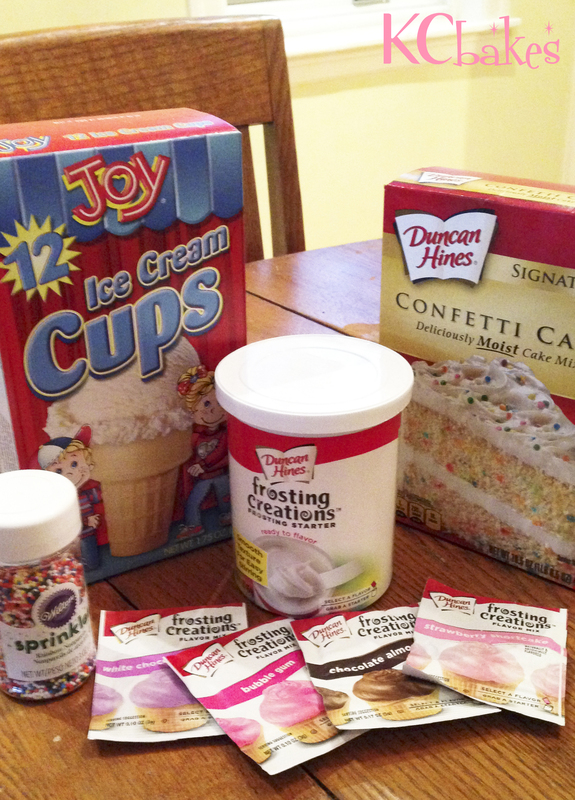 The pastel sprinkles I bought at Chocolate Treasures paired so nicely with the light colors of the frosting. 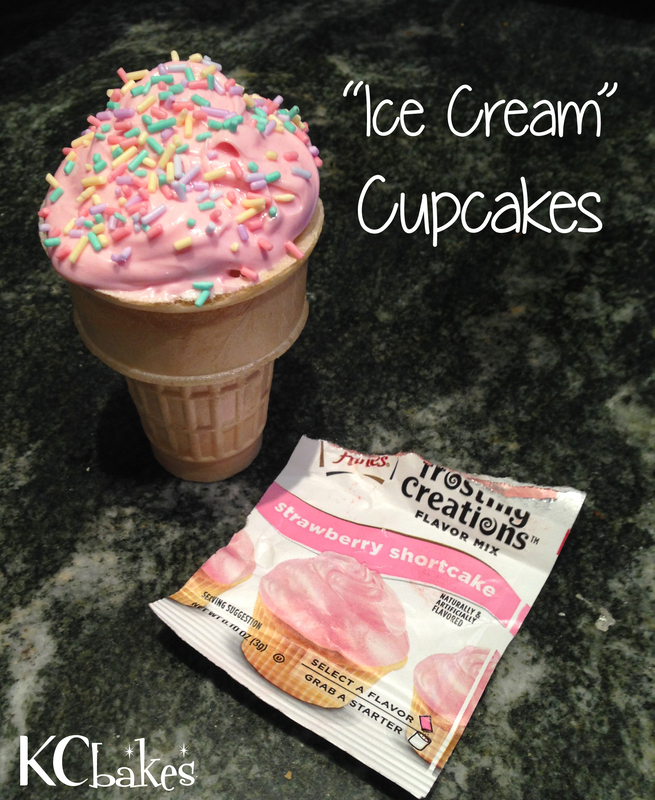 My favorite flavor was the Strawberry Shortcake frosting… it was so good! Enjoy!